These friends and family were just so excited and happy about their poke that I just had to ask for the picture. Mahalo! Creamy salmon whipped up in a spicy mayo concoction. Smoked scallops that roll over your tongue leaving a hint of smoky aroma. Or how about sweet and salty fresh ahi (tuna) cubes with crunchy sweet onion slices in each bite? Did I just see some drool there? I’ve been lucky enough to grow up with poke. It’s something parents send their kids to get when we first get our driver’s licenses. If I was headed to someone’s house for a party, a poke stop was planned and the best part was that you arrived as everyone’s best friend (until they took the poke out of your hands). I’ve never been to a Superbowl party where poke wasn’t dished out in front of the TV right next to the chips and salsa. 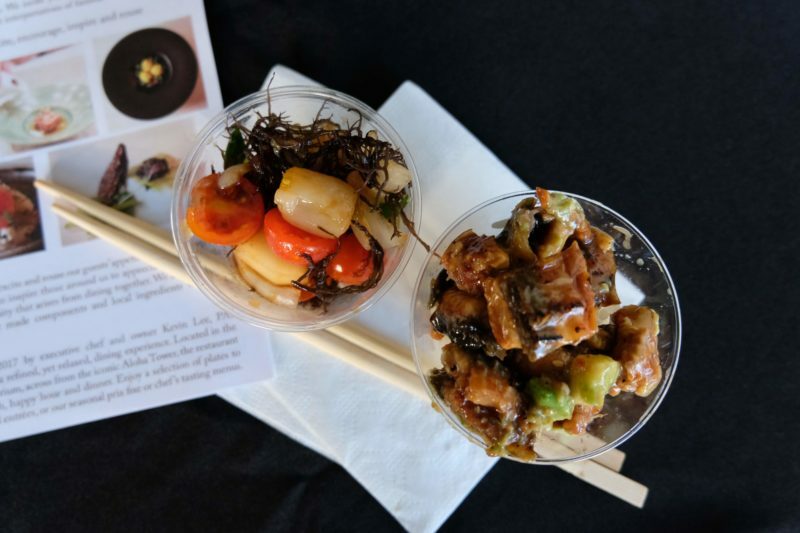 The PokeFest brings together the PokeWorld of culture, ingredients and chefs and advances it to the next level. 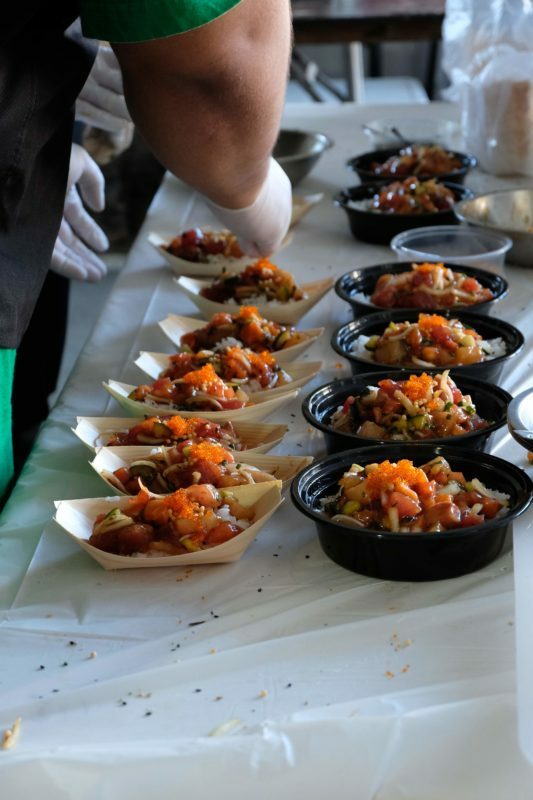 Fans of poke get to enjoy ultimate recipes put together by participating restaurants and taste sensational poke using ultimate ingredients. In fact, some of these recipes won’t even show up in their poke shops so you’ll need to attend if you want an exclusive taste. I myself had a blast there. Everyone had a smile on their face and it was so easy to peek at each table and snap these poke photos as I read about their creations. The hardest thing was to actually stick to my budget and choose which poke to eat! Could You Decide If You Were Me? The king crab poke from Tamashiro Market was selling like hot cakes and who could argue with that? Their presentation drew in crab connoisseurs as they passed and had them standing nicely in line to wait their turn. I was intrigued by Poke On Da Run’s poke nacho selection. Particularly their Mauka to Makai poke nachos (literally from mountain to ocean) looked liked it would hit the spot with kalua pork, spicy ahi and yummy kamikaze poke piled on top wonton chips fried crispy. Gochi Grill almost had me sold on their pokebowl with yukari tsukemono rice. Don’t get me wrong, I love my plain white rice, but I could eat shiso tsukemono (Japanese pickles with perilla leaves) everyday if I needed to. Local Tip: Tamashiro Market is a family-run grocery store in Honolulu that is locally-famous for its fish because they believe in locally fresh fish (not fresh-frozen-imported). Around the holidays, there’s a huge crowd here because fresh fish and poke is a must. In fact, the crowd here usually makes it into the newspaper each year – that’s how big an event it is. It’s certainly something unique to see if you’re in Oahu for the new year. 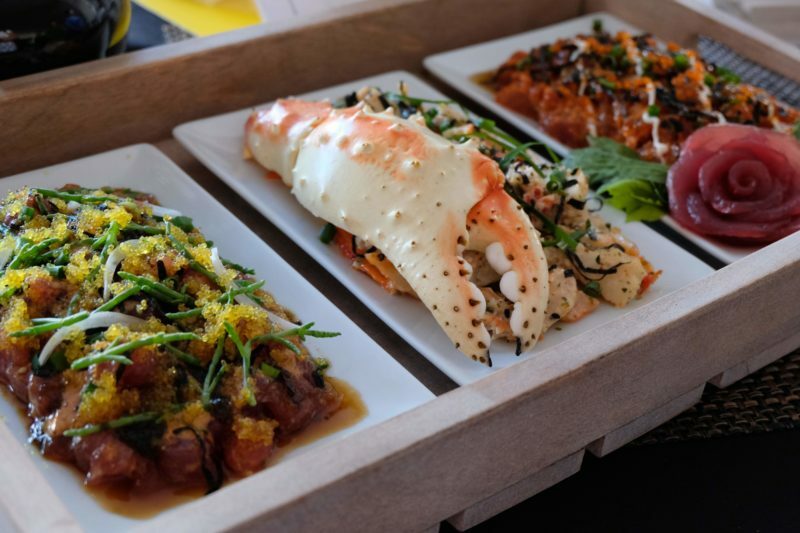 Tamashiro Market plated their delicious versions of ahi yuzu, king crab and spicy ahi poke. At the very least, budget at least $20 to just tie you over until the next meal. The small ramekin-sized plastic cups were $5 and the bowls/tubs/boats were all $10. 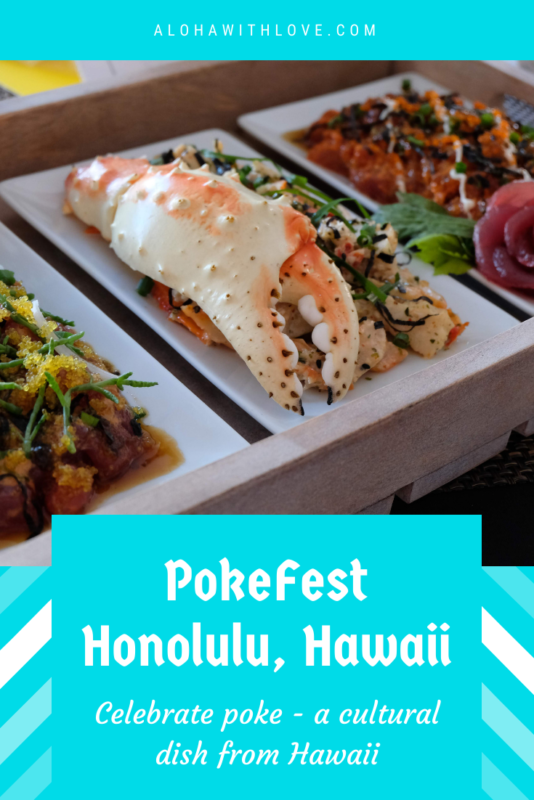 Definitely pricey if you’re looking for cheap eats, but who comes to a PokeFest where they’re serving poke with quality ingredients like ocean-fresh limu and sea asparagus to eat cheap? If you’re really into poke and want to try several of them, consider getting a PokePass package. Unfortunately, it isn’t cheaper to get the PokePass, but you will get access to an exclusive line at each poke vendor you choose. No long lines and no wait. $35 PokePass Package: Redeem for 6 poke samples – This offer is more for those going by themselves to PokeFest. 6 poke samples is $30, so that extra $5 is to get you access to the PokePass lines. $50 PokePass Package: Redeem for 10 poke samples – A much better offer. 10 samples would still cost you $50, but it would take a long time to stand at each line (some of the popular stalls had a 15-minute wait at least). If you’re going with 2 or more people, buy a few of these $50 deals and share it amongst yourselves. If you’re not sure if you’ll like poke, but consider yourself to be a foodie and would like to try, no need to purchase a PokePass. Just bring enough cash and try a few that sound good. $10 – $20 seems like a good start for poke newbies. 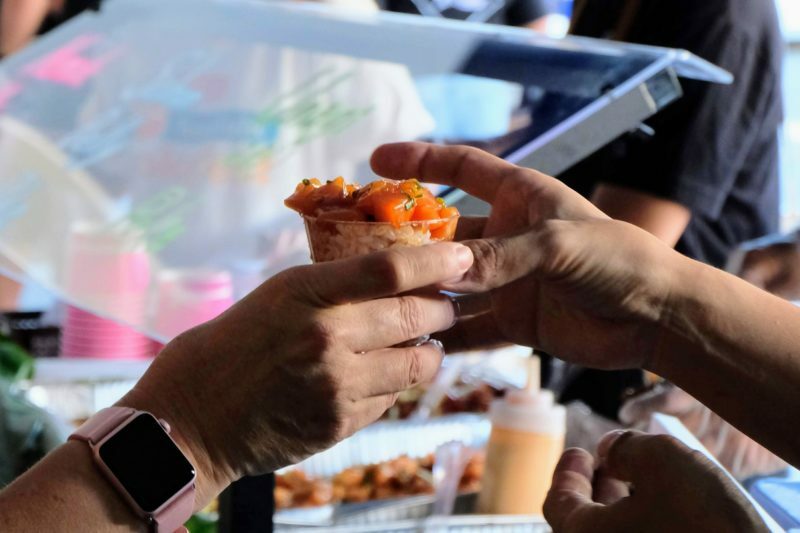 In addition to the ramekin poke samples, each booth has a larger serving served in a bowl or small dish priced at $10. These are much more filling and have 3 – 4 times more than the samples. About 2 of these larger servings make for a decent small meal. Hand over that salmon belly poke by Hawaii Sushi. Churning the poke bowls out as fast as they can. Ask any local Dad who watches football and they’ll tell you poke and beer is the way to go. This year, the Kona Brewing Company showed up with cold beers and there were a handful of standing tables that groups of people could hover around as they drank, ate and talked story. I didn’t see much variation in other foods that were available, but 1 booth was smart enough to pack a few spam musubi, which was a hit for small children. There was one child in front of me who immediately locked onto the spam musubi and his parents were only too happy to buy it for him to keep him busy as they tried out their share of poke. There were also loads of people who brought their picnic mats and beach chairs! Clusters of families and friends grouped together to not only enjoy poke, but also chowed down on other party foods they brought with them. This was a really smart idea because everyone in the group could come back with their poke and have a nice place to sit down. There was even a group of about 20 people who brought their Shiba-Inu dogs! Local Tip: I only tasted a couple of samples, but was definitely in the mood for more poke once my camera’s battery went kaput. On the drive home, I headed to Foodland where they have a great selection of poke and bought a half-pound worth of poke for about $9. If you’re in Waikiki, there’s a Foodland in Ala Moana Center and you might want to give Don Quijote a try if you’re in the area. A more traditional shoyu ahi poke but with some delicious roe mixed in. Unagi (eel) and avocado on a bed of sushi rice: This was a PokeFest exclusive by Hawaii Sushi – in other words, you cannot get this from their shop. Plus, the word on the street is that their premium sushi rice is pretty close to perfect, which is difficult to get because most excellent sushi rice recipes are kept secret. And if you’ve had unagi before, you know how tender, soft and sweet the meat is. Great combination of ingredients with a sweet and creamy effect. Smoked scallops, crispy cucumbers, cherry tomatoes, pears, ogo and jellyfish: For me, this was the winner. The smoked scallops were strong but it wasn’t overpowering because the ogo (an edible seaweed that locals love) had that fantastic ocean flavor that it’s known for. I loved the slices of jellyfish – if you know what they feel like under your teeth, there’s this great barely-there resistance with each bite. The cucumbers and ogo provided that crispy crunch, the tomatoes had a sweet pop, and the pears brought everything together with a light sweetness. Totally “YES”. Local Tip: PAI Honolulu was behind the creation of the smoked scallops poke. It’s a very classy restaurant run by Chef Kevin Lee who has been making a name for himself in Hawaii’s restaurant world. If you’re looking for a good atmosphere, intimate setting and recipes that are unique and a treat for the senses, this is one restaurant that I think you’ll be very happy with. My $5 samples. Smoked scallops on the left, unagi on the right. Shout out to the lady who let me use her tablecloth for my photos! The $10 version for my favorite poke of the day. You can find out annual Honolulu PokeFest information on their website. The 2018 PokeFest was only the 2nd annual PokeFest and so far it’s a huge hit! This year, everyone was expecting 2500 people, but about 1 hour into the festival, the staff had heard that so far the count had already reached 1800. In other words, get here early so you have time to look at the beautiful poke dishes. 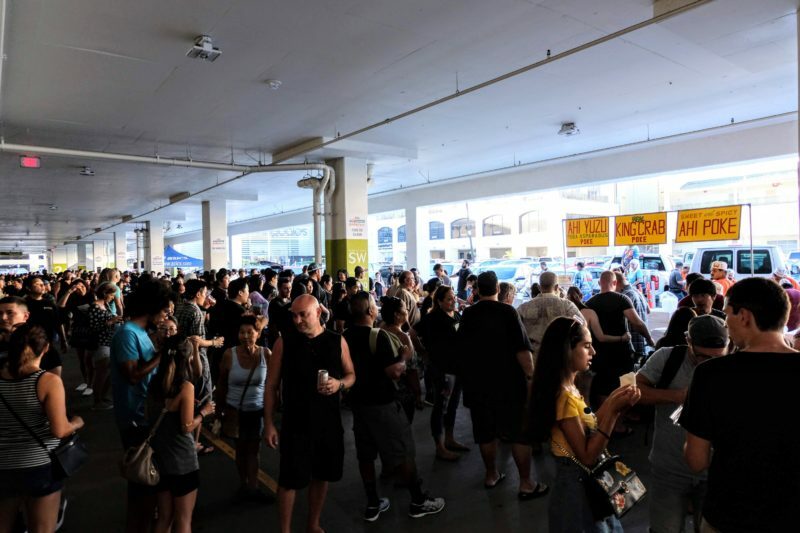 PokeFest has certainly been in one of the strangest locations by far: a covered parking lot in Ala Moana. 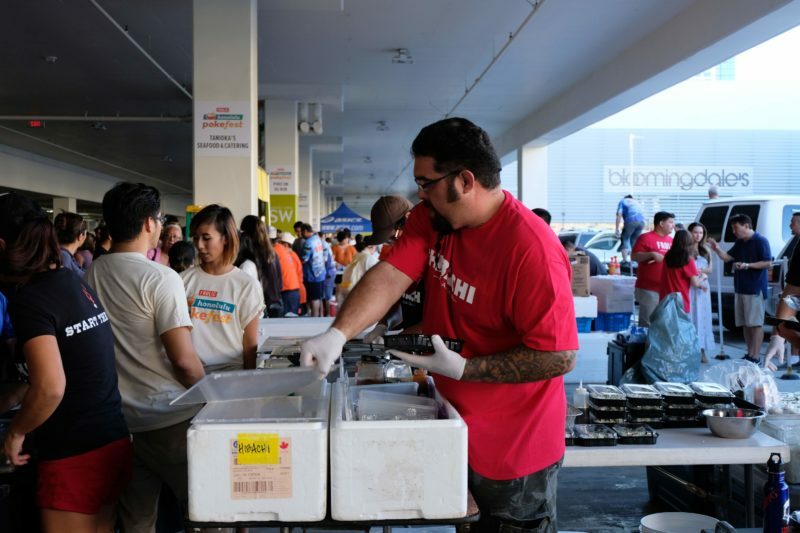 But it makes sense – with all that fresh fish, the staff will want to stay out of the sun as much as possible and it’s difficult to have a large festival inside a building. Despite the cement walls, the experience was fun and let’s face it – the parking was excellent – a rarity in Oahu. It’s definitely crowded, but most of that is just people walking back and forth. There are a few lines that force you to walk around, but that’s about it. Between 5:00 – 6:00 PM (when I was there), there was still plenty of space, especially near the back. 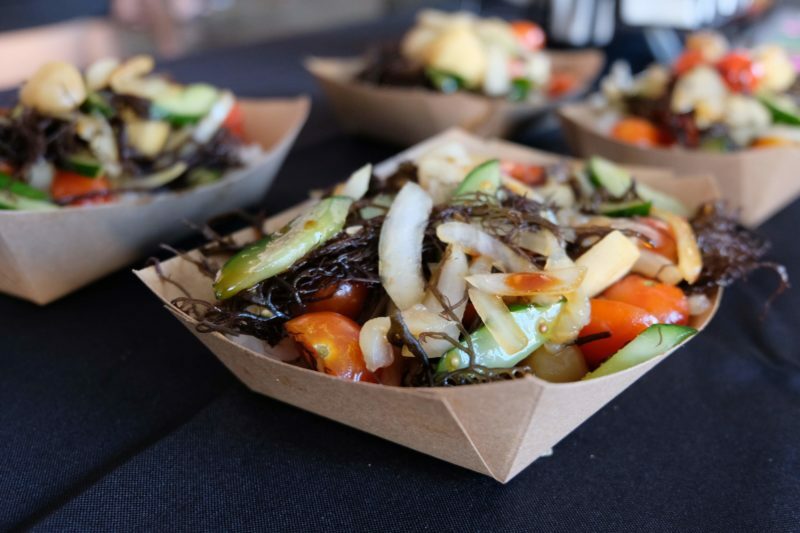 No food festival is complete without an eating contest! Watch local contestants battle for fastest poke bowl eater to win tickets for 2 to Las Vegas – Hawaii’s 9th island for locals. PokeFest is not just about spreading poke awareness, but it’s also about bragging rights for each participating vendor. You can cast your vote for your favorite poke dish and see who turns up 1st when they do the count. 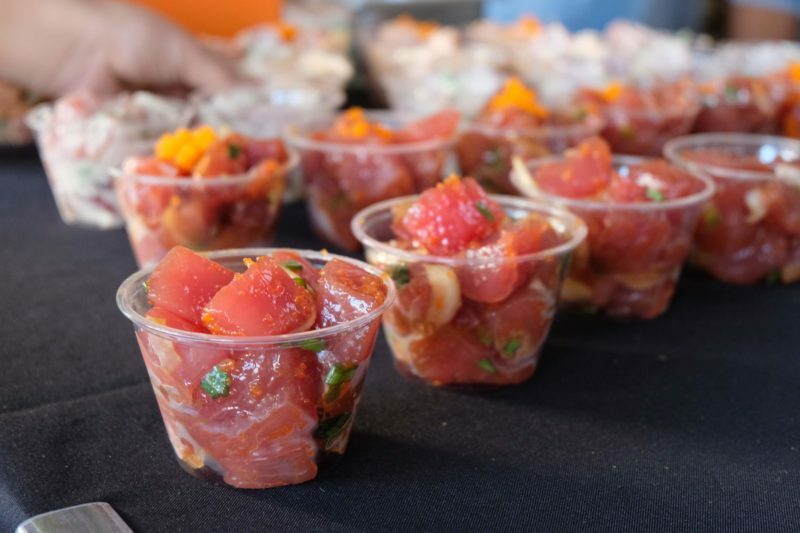 While you will drop more than a few bucks here to pay for your poke meal, a portion of the proceeds will go to Sustainable Coastlines Hawaii, a non-profit that helps our oceans. The staff are hard at work refilling poke samples and poke bowls. The poke crowd around 5:30 PM. 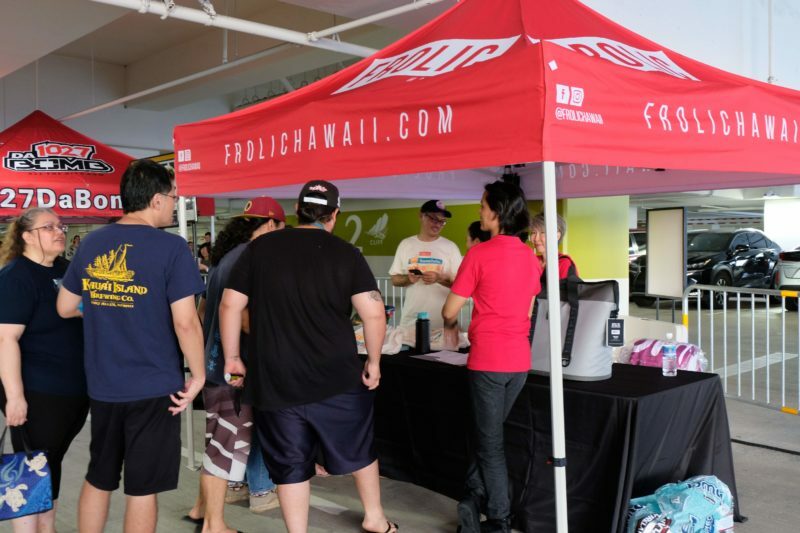 PokeFest is run by Frolic Hawaii – an online publication about eating, traveling and adventuring in Hawaii. It’s an excellent source if you’re looking for ideas of things to do in Hawaii. They had their own booth set up that you can head to if you have any questions or just want to have a chat. They were even promoting their Yeti cooler contest! If you cast your vote for best poke, you were immediately entered for a chance to win that super expensive cooler you see behind the white support stand! Mahalo Frolic Hawaii for hosting such a fabulous event! It looks like this 2nd one was also successful and I can’t wait to see what happens in the years to come. The friendly people at Frolic Hawaii were so generous in their time to answer my questions. Mahalo! So Did I Convince You To Eat At PokeFest? Foodies eager to try poke will find a moment of heaven here. I urge you to try the extravagant and unique poke dishes because you won’t find most of these in your regular grocery stores or poke shops. In fact, a few of these booths represent high-class restaurants so a $5 – $10 taste is actually a steal when you’d normally drop $100+ per person for a reservation. If you enjoyed this article about PokeFest and plan to visit Hawaii someday, sign up below to get my local Hawaii tips. It’s free and I can’t wait to help you plan the perfect Hawaii vacation.